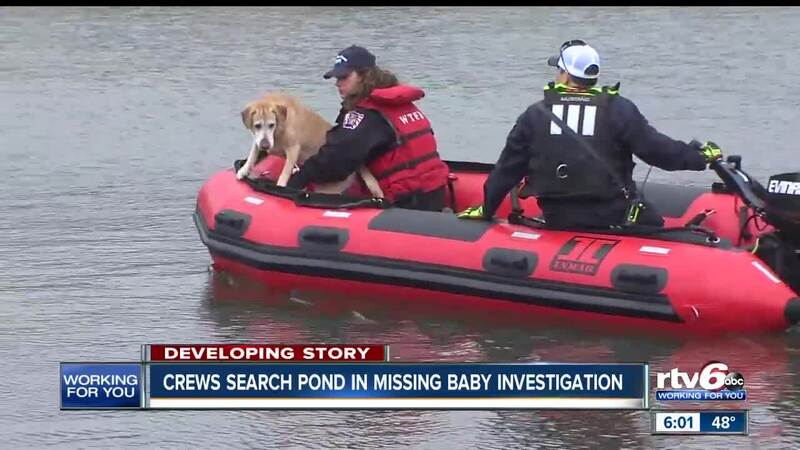 INDIANAPOLIS — A water search in connection with the disappearance of 8-month-old Amiah Robertson wrapped up for the day Monday evening on the Indianapolis northwest side. Authorities did not say whether they found anything that would lead them to Amiah. Indianapolis Metropolitan Police Department detectives and firefighters from several fire departments were called to a pond at the Mariner's Village Apartments just after 9:30 a.m. Multiple law enforcement sources have confirmed to Call 6 Investigates' Paris Lewbel that the search is in connection with the infant's disappearance. Detectives were led to this area during the course of the investigation, law enforcement sources confirmed. Detectives have been tracking down a number of leads across the city. Fire department boats used side-scanning sonar technology that creates a picture or an image of what is at the bottom of the pond. The crews are also utilizing divers to physically search underwater. Firefighters were also called out around 7:15 p.m. Sunday to the same area, but called off the search when it became too dark for them to operate safely. Amiah was first reported missing on Saturday, March 16, but Indianapolis Metropolitan Police Department detectives say the infant was last seen alive on March 9 around 1:15 p.m.
Investigators say Robert Lyons was the last person to see Amiah Roberts alive. In a press conference held Saturday, IMPD said the infant's disappearance had been updated to a homicide investigation, but the details about why it had been upgraded have not been released. Detectives say Lyons told them where the baby should have been, but after checking each of those locations they have been unable to find Amiah. They say some of the places Lyons sent them didn't even exist. Since March 10, detectives say Lyons has "taunted" Amiah's mother about where she could be. Police are asking anyone who saw Lyons or Amiah on March 9 or any day after to contact investigators. Lyons is believed to have been driving a 1996 maroon Isuzu Rodeo in "poor condition." Detectives believe Lyons was in the area of Rockville Road and South Mickley Avenue. Anyone with information can call IMPD Missing Person's detectives at 317-327-6160 or 317-327-3811 or Crime Stoppers of Central Indiana at 317-262-8477. This is a breaking news story and will be updated as we get more information.